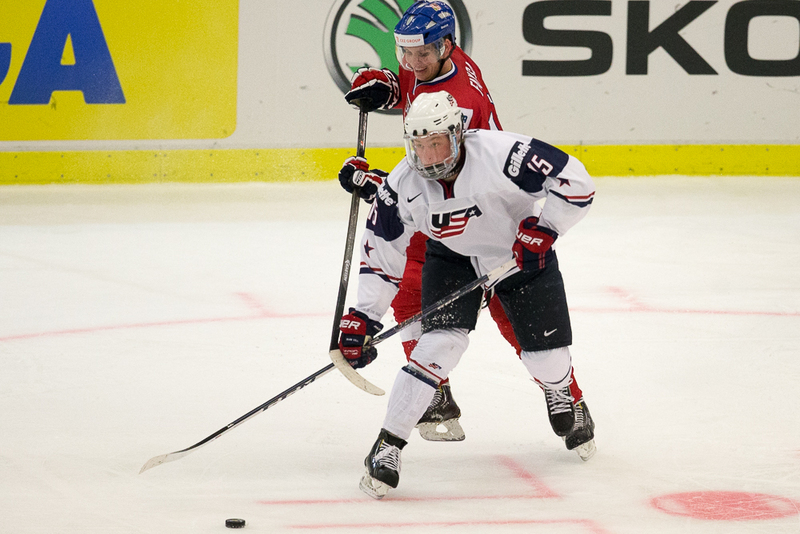 The past two weekends were quite busy for Jack Eichel and the Boston University Terriers. On the weekend of October 24th and 25th, Eichel faced off against the Michigan State Spartans and Michigan Wolvernies. This past weekend, the Terriers began to get into the meat of their schedule with a home-and-home series against the Providence Friars. In their easiest matchup of the four games, the Terriers started out against Michigan State. In the opening shift of the second, the Terriers set up in the offensive zone as junior captain Matt Grzelcyk handled the puck at the point. He gave the puck to Eichel along the left half boards, and Eichel started to move towards the net. He held onto it long enough to draw two Michigan State defenders towards him, and then dished the puck to an open Oksanen in the slot. Occupying the space left by the Michigan State defender, Oksanen went forehand-backhand, and put the puck past Hildebrand to give BU the 1-0 lead. The Terriers would pepper Hildebrand with 40 shots by the time the game was over, but he yielded no more goals. Thankfully for the Terriers, Matt O’Connor stood on his head and got his first career shutout to give BU the 1-0 win. Eichel and his two linemates (O’Regan and Oksanen) each finished with a game-high 5 shots on goal. ESPN College Hockey expert John Buccigross was on hand to watch the game, and was impressed by Eichel’s play and demeanor off the ice. He likened him to a lava lamp on the ice. It may seem like an odd comparison, but if you watch him play, you see how it applies. At times, it appears that Eichel is almost floating out on the ice. It gives the illusion that maybe he isn’t going 100% or skating as hard as he could. But then you see him blow by a defender with that effortless stride of his, and you realize he’s not gliding, his stride is just that fluid and powerful. On the latest round of strength testing, he front-squatted 320 pounds, cleaned 335 pounds, had a close-grip bench press of 250 pounds, a pull-up max of 25 reps, and body fat percentage of 6.3 percent. For a reference, 2014 3rd overall pick Sam Bennett was unable to do a single pull-up at last year’s NHL Combine, and could only wide grip bench 150 pounds twice. On Saturday the 25th, the Terriers faced the Michigan Wolverines. 2015 1st round hopeful Zach Werenski got the scoring started for Michigan in the first on a one-time blast from the point on the power play. After another Michigan power play goal in the second, the Terriers began the 3rd period in a 2-1 hole. A few minutes into the third, the Terriers had the puck in the Michigan zone. Defenseman Doyle Somerby had the puck at the point, and fired a waist-high shot towards the net. Eichel, standing in the high slot, was somehow able to deflect the puck mid-air (despite being very close to Somerby), changing the trajectory and putting it past Nagelvoort. With all due respect to Copp, I’m not sure what else he would like Eichel to do. Eichel had a game-high 7 shots, scored the game-tying goal, and was on the ice for another BU goal. And he did it three days before his 18th birthday. After their two wins against the state of Michigan, the Terriers moved up to #6 in the polls. Game one of the series was in Providence’s Schneider Arena, and was the #9 Friars’ home opener. Providence was able to take a 1-0 lead to start the game, but after that goal, it was all Terriers. BU answered to tie the game 4 minutes later, and outshot the Friars 16-6 in the first. Two minutes into the second period, the Terriers went to the power play and Eichel went to work. Quarterbacking the power play, Eichel fired a quick shot from the left circle after a nice drop pass from Evan Rodrigues. Providence goalie Jon Gillies was able to get a piece of it, but it squirted behind him where Oksanen put it in for a 2-1 Terrier lead. Playing a man down in the third period, the PK forward tandem of O’Regan and Eichel chipped the puck into the Providence and then put some pressure on the Providence defense. O’Regan forced a turnover in the corner, and found a wide open Eichel in the slot. With all the time in the world, Eichel made no mistake and put the puck past Gillies with a quick wrist shot for his first career shorthanded goal. Eichel, again, finished with a game-high 8 shots as the Terriers badly outshot Providence 41-18. Saturday night, the Terriers were seeking their first 5-0 start since 1991. After their win Friday night, David Quinn declared the game the next day would be their most difficult of the season. Providence had their backs up against a wall, facing a 1-4-1 start if they didn’t beat the Terriers. Providence came out with the same fury the Terriers showed the night before, jumping out to a 1-0 lead in the first, outshooting the Terriers 17-5. Things got a little better in the second as the Terriers outshot Providence 15-10, but Providence was able to add a second goal to make it 2-0 heading into the third. The Terriers huffed and puffed, but couldn’t blow down the wall that was Jon Gillies in the third. They were able to score one goal on the power play, where Eichel took a shot from the same spot as the night before that led to the Oksanen goal. After a mad scramble in front, Danny O’Regan finally put the puck home, with Eichel getting the secondary assist. Despite an 18-6 shot advantage in the 3rd, and a 38-33 advantage overall, the Terriers suffered their first loss of the season. Eichel led the game in shots, and is currently lapping the field in shots in Hockey East. Eichel leads Hockey East with 6.20 shots on goal per game. Linemate Oksanen is second at 4.60. No one else has more than 4.17. Eichel finished the two weekends with a combined 2 goals and 3 assists. He is currently 6th in regular season points (9 in 5 games), and tied for first in points-per-game (1.80). He has a point in every game (regular season and exhibition), and has 17 points in 7 games in all combined games. Up Next on the Jack Eichel Tracker: Things won’t get any easier for the Terriers as they head to Boston College aka Newton University to face Noah Hanifin and the #3 Eagles. The Terriers will then face the UConn Huskies on Saturday. Jack Eichel of @TerrierHockey vs. Noah Hanifin of @bchockeyblog1, meet head on in 'Green Line Rivalry' on Friday at BC on @NBCSN at 8 pm ET. Friday's game between No. 3 BC and No. 5 BU is the first time that both teams will face off as top-5 ranked opponents since Feb. 13, 2012.